35,500,000 Placement Shares at S$0.30 each by way of placement, payable in full on application. Versalink Holdings Limited and its subsidiaries (“Versalink” or “the Group”) is one of the leading and established Malaysia-based manufacturers of mid to high-end system furniture that provides products and services to more than 90 overseas dealers located in more than 40 countries in Australasia, Asia, Middle East, Africa and North America. Versalink is principally engaged in the design, manufacture and supply of a wide range of system furniture under its “Versalink” brand or on an original equipment manufacturer basis that can be tailored to customers’ specifications. Versalink also supply ancillary products such as seating models and work tools. In addition, Versalink is also the reseller for various established international third party brand of premium office furniture. 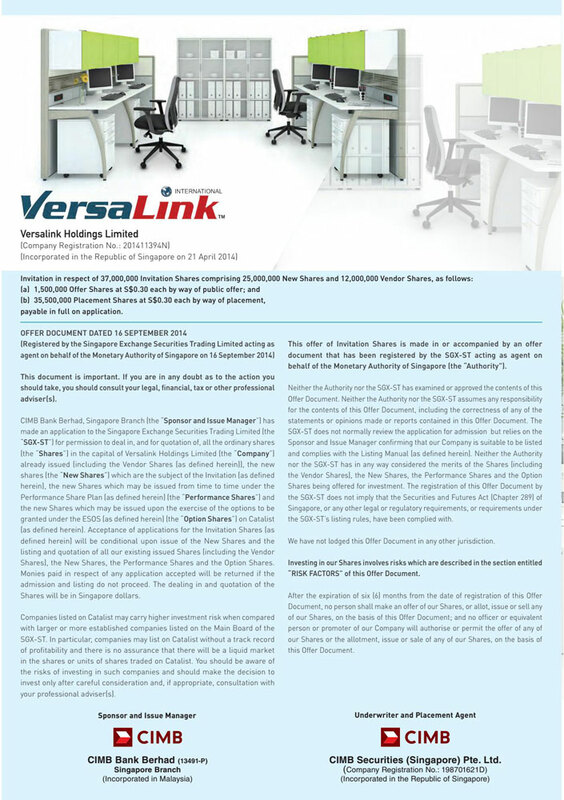 As part of its value-added services, Versalink also provide workspace planning and consulting services to its customers. The Group debut on the Catalist on 24 September 2014.
cfSolutions was the Malaysian Financial Adviser for Versalink Holdings Limited.